There are a lot of things to do in Seoul and the city it’s well know for being one of the most gay friendly cities in Asia. There are plenty of gay friendly hotel Seoul. During your stay in the South Korean capital you can do a tons of things as watching the Changing of the Guard at Changdeokgung and Gyeongbokgung Palaces. Get Lost (and then to be found) in a Maze of Traditional Houses at Bukchon Hanok Village. Lock your Love and Climb to the Top of N Seoul Tower for the romantics one’s. Yongsan-gu district is the main area for the gay friendly hotels in Seoul and our hotels recommendation are mainly located in that district of Seoul. Surrounding the 5-star Grand Hyatt Seoul is the nature preserve of Mount Namsan. Featuring a free schedule shuttle bus around the city, the luxurious hotel has its own shopping arcade, outdoor and indoor pools and ice skating rink. 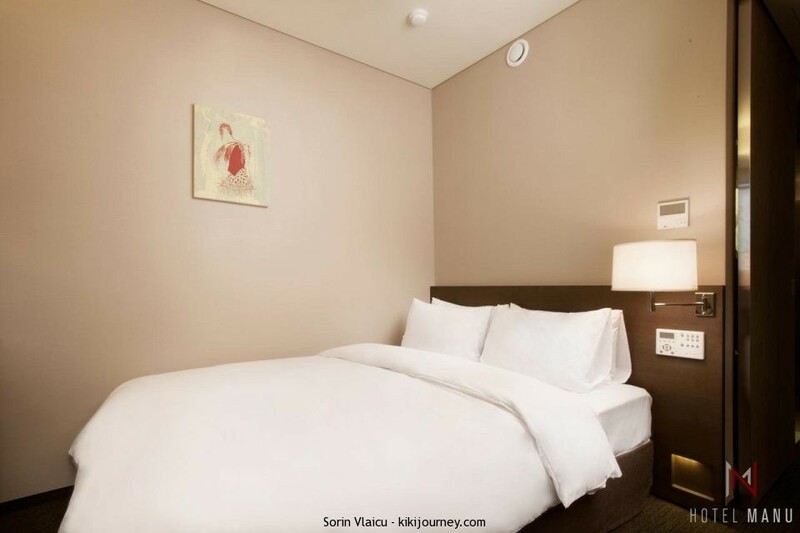 Air-conditioned with heating, the carpeted rooms provide large windows offering views of the city or Mount Namsan. Amenities include a flat-screen satellite/cable TV, DVD player and Wi-Fi. This hotel is located at the top hill of NamSan, little away from the downtown area, but the rooms with the river views give pretty good scenery. There is also Gyongridan gil nearby with different restaurants and cafes. The room is a bit on the smaller size. The work desk was glass and faced the window. The chair was fairly standard and not ergonomic. Therefore, as a work station, this was not conducive to long stretches of work. There was a small couch in the room with a very odd side table. This with the small size of the room made it very cluttered. The bed itself was fairly comfortable and the controls for the lights etc were easy to use. The TV set was very oddly placed. The bathroom was correspondingly small and had an washout toilet seat. The shower was decent and the water pressure and temperature were acceptable. The hotel takes full advantage of its setting, with beautiful views of the city, an Olympic-size outdoor pool, lovely grounds and a peaceful vibe throughout the hotel. Even though the city is a quick ride away, the hotel feels like a quiet retreat. You pretty much have to take a taxi or the hotel shuttle to go anywhere, but it’s a quick ride to the city center and taxis are inexpensive (under $10 for most locations), plentiful and clean. The breakfast is great with plenty of choices. The evening cocktail hour had such a large selection that it could easily replace dinner. The hotel has many restaurant choices and a great lobby lounge with live music. 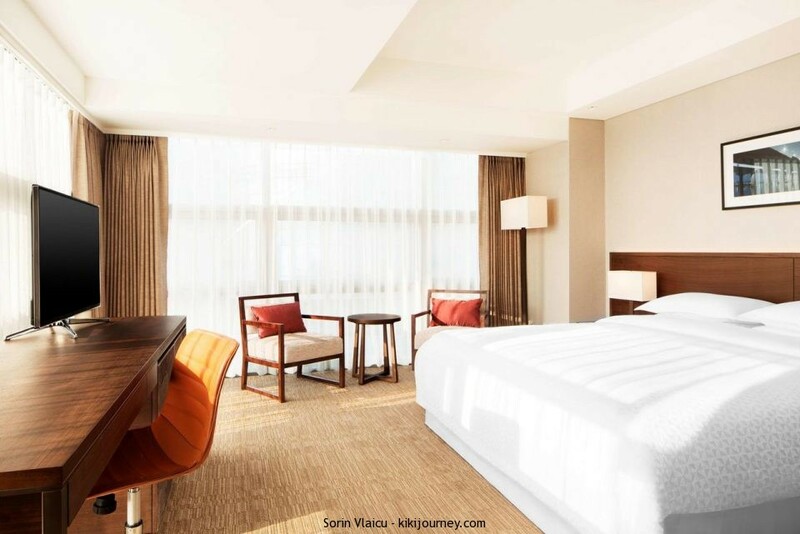 How much does a room costs at Grand Hyatt Seoul? 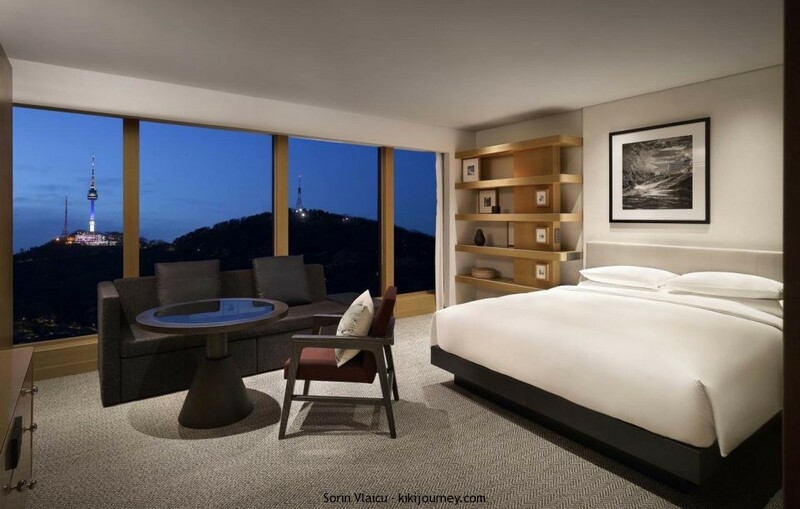 Prices start 275$/night for the 1 King Bed Mountain View. The Grand Suite King is 420$/night. Grand Suite King Room is 53 to 60 m² and offers plush extra large double bed, a seating area and a working area. En suite bathroom includes a walk-in shower and a dark green marble bath. Enjoy panoramic city and river views through floor-to-ceiling windows. Grand benefits include complimentary breakfast, canapés and cocktail. Where to book Grand Hyatt Seoul – Gay Friendly Hotel Seoul – you can find the best hotels deals in Seoul on Booking.com and Agoda.com. Our second recommendation for a gay hotel in Seoul is a 2* hotel with good amenities. This property offers non-smoking rooms. Located 1.7 km from National Museum of Korea, Philstay Itaewon is situated in the Yongsan-Gu district of Seoul. 2.5 km from I’Park Mall, the property is also 2.6 km away from Seven Luck Casino Millennium Seoul Hilton Branch. Guests can make use of a shared lounge. It is conveniently placed amongst all the restaurants and bars. Close to the railway station. Very near Itaewon station and Itaewons nightlife just one street away. Location is also very good if you like to party or just want to stay in a lively area. Bars, cafes and restaurants are abundant in the area. You will never be short of places to hang out. Rooms are clean and have modern comforts such as A/C, TV and a mini fridge. For breakfast, guests are welcome to cook their own food. Eggs, bread, coffee and cereals were free. Rooftop is a great area to go hangout with friends (keep in mind the rooftop is off limits after 11pm, too much noise has the neighbour’s complaining) but it has the best views (especially at night). Free WiFi is accessible to all guests, while some rooms also offer a terrace. The rooms are secure, equipped with an electronic keypad and locked windows. 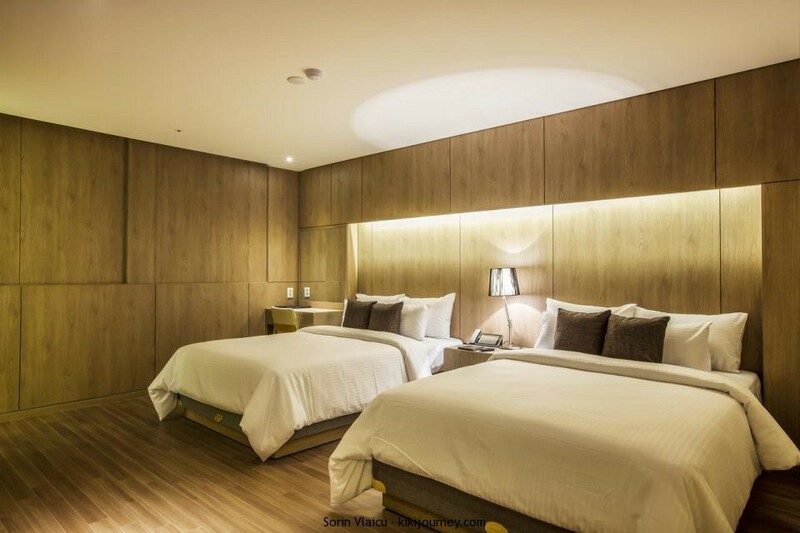 How much does a room costs at Philstay Itaewon Hotel Seoul? Prices start 55$/night for the Double Room. Where to book Philstay Itaewon Hotel Seoul – Gay Friendly Hotel Seoul – you can find the best hotels deals in Seoul on Booking.com and Agoda.com. Offering a restaurant and a fitness centre, Four Points by Sheraton Seoul Namsan is directly connected to Seoul Station via an underground passage. The hotel offers free WiFi in all areas as well as free on-site parking. Each room here has air conditioning, a work desk, a safety deposit box and ironing facilities. Private bathroom is fitted with a walk-in shower and comes with bathrobes and slippers. Free bath amenities are provided. Convenient location with underpass linking to the station that is a warm passage way for freezing winter temperature. There are quite many eateries around the hotel and convenient stalls too. There is a direct airport bus connecting from Incheon Airport to the hotel. – Take the Arex express train to Seoul Station. – Follow signs for Four Points. The walk from train station took about 15min total because you have to all the up from B7 level where the train drops you off, but it’s very easy. The hotel location is convenient to reach line 4(6 min walking) and line 1 needs extra 6-8 min walking. There is a shuttle service but with limited time offerings and only runs Monday to Saturday. The corner rooms and have a lot of glass and sunlight offering spectacular views of the city. The room is modern and immaculate and well maintained. The room itself was very clean and well designed although a little small. The bathroom is nice and water pressure was great the views from the room weren’t bad either. Breakfast buffet has a lot of variety but is still pretty much the same food every day. Having a varied international clientele the food choices were all over the place but there was plenty of good food. Breakfast in the buffet is outstanding; F&B staff always approaching you to check if you need any assistance. How much does a room costs at Four Points by Sheraton Seoul Namsan? Prices start 150$/night for the Superior Double Room with breakfast included. The Deluxe King Room is 190$/night. Where to book Four Points by Sheraton Seoul Namsan – Gay Friendly Hotel Seoul – you can find the best hotels deals in Seoul on Booking.com and Agoda.com. Just in front of Itaewon Subway Station (Line 6), Hamilton Hotel offers modern rooms with free internet in Seoul’s Itaewon District. It has a seasonal rooftop pool and a large sauna. The air-conditioned rooms are simply furnished, each equipped with a cable/satellite TV and minibar. Ironing facilities and en suite bathrooms with hot shower facilities are also included. Location is perfect for subway and other transport connections. The hotel itself is located in the middle of all the nightlife with lots of restaurants in the streets behind and close by. The location is excellent, being in the heart of the buzzing Itaewon-ro. There are bars and restaurants galore on the doorstep. The room itself is fairly large and comfortable as is the bathroom that has a very complicated (and typically Korean) toilet. The room has a good size, the bed is comfortable, and the bathroom clean, with a decent sized bath and a clever toilet. The free wifi worked fine, and there was a kettle in the room. The buffet breakfast is very good with lot of choices, but they only served western food not local food. How much does a room costs at Hamilton Hotel Seoul ? Prices start 80$/night for the Standard Double Room. The Suite 170$/night. The suite has a spacious living room with a sofa, a coffee table and a work desk. There also are a minibar, a flat-screen TV and an electric kettle. Private bathroom is fitted with both a bath and a shower. Where to book Hamilton Hotel Seoul – Gay Friendly Hotel Seoul – you can find the best hotels deals in Seoul on Booking.com and Agoda.com. Our last suggestion for a gay hotel in Seoul is a excellent 3* hotels both in amenties and location. 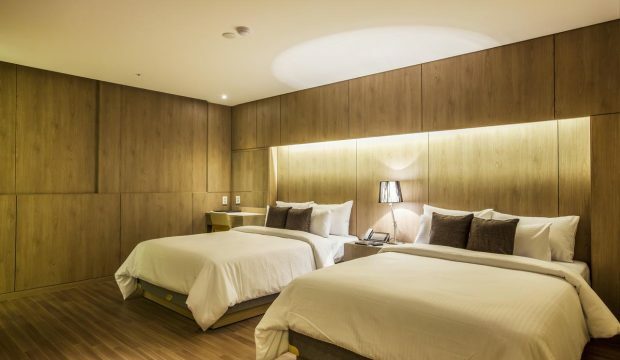 Hotel Manu Seoul is connected to the newly constructed 7017 Park, and is a 10-minute walk from Hoehyun (Line 4) and Seoul (Line 1) subway stations. The hotel houses a massage parlour, 24-hour rooftop garden and free-use fitness centre. Well-designed and clean, all guest rooms come with a flat-screen TV, minibar and desk. En suite bathrooms are equipped with a shower and bidet. Very convenient location and it is entirely possible to drag your luggage from Seoul Station all the way to the hotel as the hotel’s lobby is connected to Seoullo. After exiting from Seoul station to ground level, take an elevator/lift up to Seoullo and head in the direction of Hoehyeon station. Hotel Manu will be on your left after a 5 – 7 minute walk. You should not need to carry your luggage across many stairs. Room is clean and spacious enough, with a modern decoration. The bathroom is super cool, with a nice Italian shower and futuristic toilets with bidet function. Beds were comfortable and not too hard. Completely soundproof and relaxing place. The rooms are clean and housekeeping are very efficient and hard working. The rooms air conditioning is superb. It was hot weather when i went so keeping the AC on during those hot days was quite relaxing. There are shampoo conditioner and body gel fully stocked and the shower has a door which was a nice touch. The water pressure is amazing. Its strong and water gets very hot. They have those high tech toilets. Heated seat, bidet and automatic flushing. The hotel serves breakfast at the Lobby cafe (2nd storey) but is definitely not worth the price – 6$/person. How much does a room costs at Hotel Manu Seoul? Prices start 120$/night for the Standard Double Room. The Superior Double room is 150$/night. Where to book Hotel Manu Seoul – Gay Friendly Hotel Seoul – you can find the best hotels deals in Seoul on Booking.com and Agoda.com. For Day Tours in Seoul check the available tours here.